Multispectral Chiral Imaging with a Metalens. The calculation‡ is at the ωB97XD/Def2-TZVPPD/SCRF=water level (water is here used as an approximate model for a condensed environment, helping to bind the two added electrons). An NBO (Natural Bond orbital) analysis reveals a total Rydberg orbital population of 1.186e and the following bond indices; F 0.853, C 3.977, C(methyl) 4.051, H(*3) 1.332. The latter corresponds to the three methyl hydrogens aligned antiperiplanar to the C-F bond. To put this value into context, the hydrogen in the FHF– anion has an NBO H bond index of 0.724, and the bridging hydrogens in diborane only have a value of 0.988. 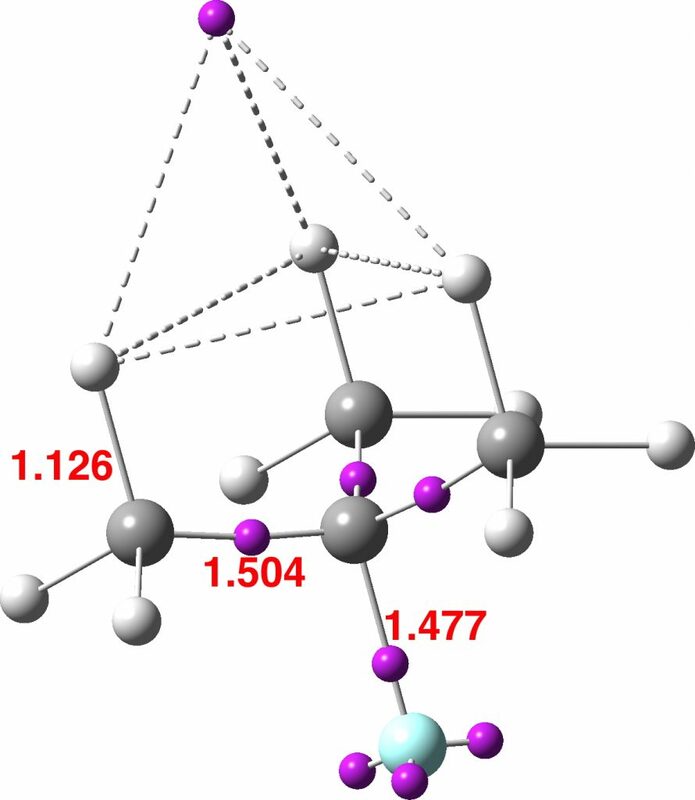 Even the hexa-coordinate hydride system [Co6H(CO)15]– discussed in an earlier blog has an H bond index of just 0.86. 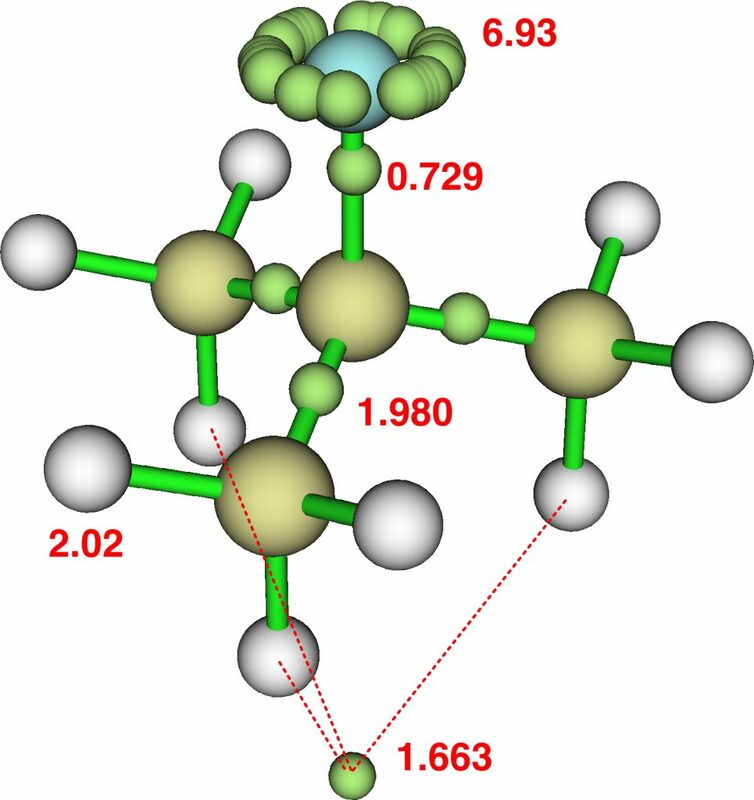 Actually, coordination of six or even higher for hydrogen is no longer rare; some 28 crystal structures of the type HM6 (M=metal) are known (it would be useful to find out if any of the other 27 such structures might have a hydrogen bond index >1). Next, the ELF analysis (Electron localisation function), analysed firstly using the excellent MultiWFN program. This reveals an attractor basin integrating to 1.663e and located along the axis of the F-C bond and extended into the region of the three antiperiplanar methyl hydrogens. The C-F bond itself only supports a basin of 0.729e, typical of the fairly ionic C-F bond. The covalent C-Me bonds are also pretty normal, as are the other hydrogens. I also show ELF analysis using the alternative TopMod program; the numerical values on this diagram are the calculated bond lengths in Å. The basin integrations are very similar to those obtained using MultiWFN. The Wiberg bond orders of the three H…H regions shown connected by dashed lines above are 0.154, which contributes to the bond index of >1 at these three hydrogens. The predicted 1H chemical shift of these three “hypervalent” hydrogens is +3.0 ppm, whilst the other six methyl hydrogens are at -0.87ppm. So changing CH3F2- to CMe3F2- has dramatically changed the bonding picture that emerges, rather than a fine-tuning. The C-F is no longer a “hyperbond”, although the Rydberg occupancy of 1.186e remains unusually large. Most of the additional electrons have fled the torus surrounding the C-F bond and relocated to the exo-region of that bond where they now influence the three antiperiplanar methyl hydrogens. A two-electron-three-centre interaction if you like, but with the electron basin occupying a tetrahedral vertex rather than the triatom centroid. I end with a challenge. Is it possible to find “real” molecules containing hydrogen where the formal bond index for at least one hydrogen exceeds 1.0 significantly, thus making it hypervalent? ‡The calculations are all collected at FAIR doi; 10.14469/hpc/3372. This entry was posted on Saturday, January 13th, 2018 at 9:37 am and is filed under Hypervalency. You can follow any responses to this entry through the RSS 2.0 feed. You can leave a response, or trackback from your own site. “…some 28 crystal structures of the type HM6 (M=metal) are known”. A list of 28 structure data citations can be seen at 10.14469/hpc/3576. Hypervalent hydrogen? is licensed by Henry Rzepa under a Creative Commons Attribution-Noncommercial-Share Alike 3.0 United States License.